Danny and his younger sister, Peg, are placed in St. Joseph, Missouri, with kind Alfrid and Olga Swenson. Danny is thrilled to have a "real" father again, but when Olga suddenly dies, he is devastateduntil he thinks of an ingenious plan to find Alfrid a new wife. 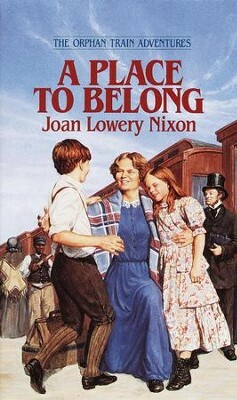 Joan Lowery Nixon was the author of more than 130 books for young readers and was the only four-time winner of the Edgar Allan Poe Best Young Adult Mystery Award. She received the award for The Kidnapping of Christina Lattimore, The S&eacute;ance, The Name of the Game Was Murder, and The Other Side of the Dark, which also won the California Young Reader Medal. Her historical fiction included the award-winning series The Orphan Train Adventures, Orphan Train Children, and Colonial Williamsburg: Young Americans. I'm the author/artist and I want to review A Place to Belong - eBook.